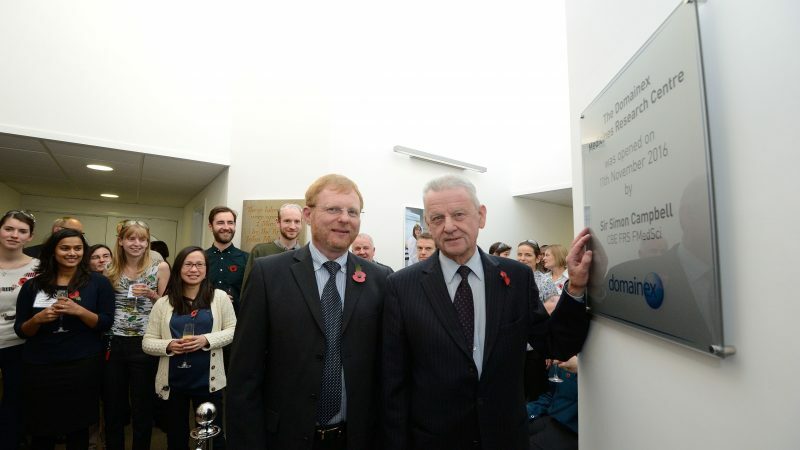 Sir Simon Campbell CBE FRS FMedSci was welcomed by staff, and guests when he officially opened The Domainex Medicines Research Centre on Friday 11th November. The new facility, located on Chesterford Research Park, has been home to Domainex since August 2016 and doubles the laboratory space available to the company’s growing team of scientists. Sir Simon Campbell, along with three of the founders of Domainex, Laurence Pearl, Paul Driscoll and David Selwood, and 50 guests from partner research institutions, biotechnology and pharmaceutical companies were given a preview of new drug discovery services to be launched in 2017 and a tour of the state-of-the-art facilities, including Domainex’s proprietary Combinatorial Domain Hunting (CDH) laboratory. Established in 2001 as a spin-out from University College London, Birkbeck College and the Institute of Cancer Research, Domainex is a privately-owned, rapidly-growing drug research company with expertise in expression of disease target proteins, hit discovery, hit-to-lead identification and lead optimisation. It has an established reputation for its high-quality, innovative approach and has a sustained track record of delivering preclinical drug candidates. Domainex has a wide range of UK and international clients including biotechnology and pharmaceutical companies, and several leading academic groups. Established in 2001 as a spin-out from University College London, Birkbeck College and the Institute of Cancer Research, Domainex Ltd. is a Cambridge-based, privately-owned small-molecule therapeutics company that provides integrated drug research services to pharmaceutical, biotechnology and academic partners globally. Services cover a wide span of the drug research value chain, from disease target validation to pre-clinical candidate nomination. Domainex’s services include recombinant protein expression and use of its proprietary technology platform, Combinatorial Domain Hunting to identify soluble protein fragments for structural biology and assay development. Hit finding activities encompass assay development and screening utilising its Bioassay Builder and LeadBuilder platforms. The core of the service offering is undertaking multi-parameter medicinal chemistry optimisation of hits and leads under the mantra ‘every compound counts’, which can save up to 30% on the average industry time from target to candidate. Additionally, Domainex is investing in developing its own therapeutic compounds for out-licensing in two specific areas: 1) Inhibitors of the kinases TBK1 & IKK epsilon to treat inflammatory conditions such as COPD and Lupus; 2) the emerging epigenetic target class of lysine methyltransferases implicated in oncology and other diseases, where to date Domainex has built a portfolio of assets encompassing novel chemical matter, proprietary assays and X-ray crystal structures.